When it comes to ‘fun’ gadgets, there’s novelty value and then there’s plain annoying – it’s in the latter category we suspect Thanko’s newest wacky MP3 player belongs. The 89g, ¥5,980 (£30) ‘Cranking MP3 Player’ is a wimpy 1GB DAP that can be charged up by turning the clockwork winder that pops up from the back of the body. It’s clearly very eco-friendly and all that but the only problem is it takes 30 minutes of cranking yourself silly at 2.5 strokes per second to get the thing fully charged. We make that a whopping 4,500 revolutions just to listen to a little music. 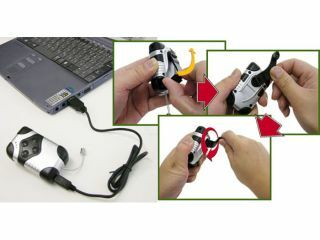 Should you persist with the winder instead of making like a sensible human being and connecting the thing to a USB port, you’ll be rewarded with just over three hours of playback time. Still, Thanko aren’t entirely stupid – they’ve thoughtfully embedded an LED flashlight in the device that will shine on for almost an hour on just a minute of winding, which isn’t silly at all.